Vegetable gardeners know that in addition to offering the ultimate in taste, fresh-from-the-garden produce gives you superior nutrients. Pick a ripe strawberry, and you have in hand good-for-you goodness, including essential probiotics. These naturally occurring living microorganisms or “good bacteria” enrich the chemistry in your intestinal system and ward off disease. 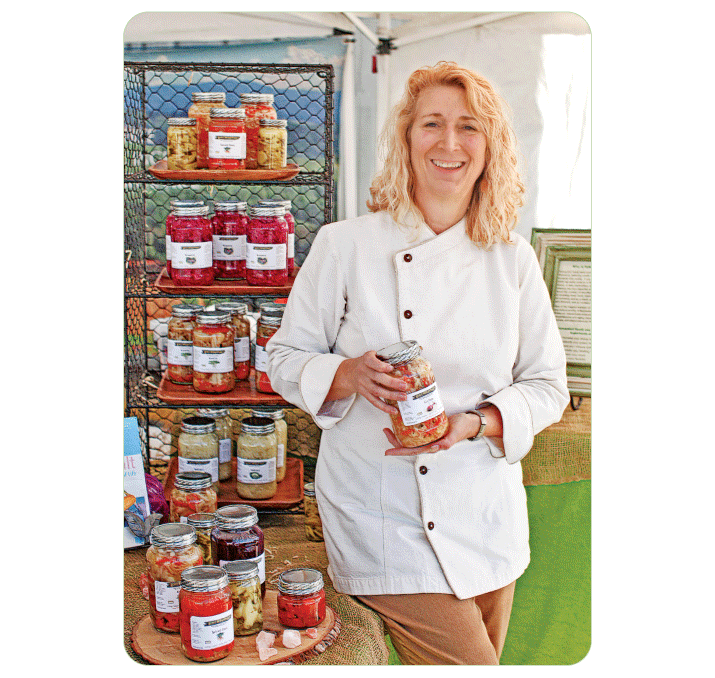 Chele Eades, co-creator of Wildly Fermented available at the Old Towne Orange Farmers and Artisans Market every Saturday, has kicked things up a notch by fermenting fresh produce to create tasty products designed to nourish. Stress, taking antibiotics and medications and eating processed foods are everyday actions that can impair digestion. “Fermented foods can boost the number of beneficial bacteria in your gut, which means better absorption of nutrients, and as a result less gas, bloating, inflammation, skin blemishes and illness. Energy, elevated mood and mental clarity increase,” says Eades who for five years worked in holistic oncology in Arizona educating cancer patients about the importance of food to health. Eades became a certified raw foods chef in 2004 and in 2011 decided to share her passion for nourishing foods by opening Wildly Fermented. Drawing from traditional world cuisines and recipes she learned from her grandmas, Eades created a line of flavorful fermented foods, such as RyKraut, which people find tastier than regular sauerkraut, KymChi, CurTido (cabbage, carrot, red onion, lime, oregano and red pepper), Spiced Stars (carrot, ginger, cumin, yacón, parsley and orange juice), Brassica (purple cabbage and leeks), Gingered and Herb-ed cloves (garlic). A popular product containing some fermented ingredients is Zuchi dip, made with zucchini and fermented olives. Eades uses mineral-rich Himalayan salt crystals in her products. Consume a quarter cup of fermented foods daily. Eat them raw in salads and on wraps, sandwiches, burritos, tacos, pizza, grilled fish, eggs, or simply eat them straight like you would fresh garden produce. Visit Wildly Fermented Saturdays at the Old Towne Orange Farmers and Artisans Market. Join Eades on January 24th at 10 am for a presentation on “Entree Salads” at the market.